ACTIVITY HAS BEEN detected at a North Korean long-range rocket site, suggesting Pyongyang may be pursuing the “rapid rebuilding” of the facility after the collapse of the Hanoi summit, according to analysis of satellite imagery. Last week’s meeting between North Korean leader Kim Jong Un and US President Donald Trump ended abruptly after the pair failed to reach an agreement on walking back Pyongyang’s nuclear programme in exchange for sanctions relief. The renewed activity was recorded two days after the summit and may “demonstrate resolve in the face of US rejection” of the North’s request for sanctions relief, said researchers at the Washington-based Center for Strategic and International Studies (CSIS). Kim had agreed to shutter the Sohae missile-testing site at a summit with the South’s President Moon Jae-in in Pyongyang, as part of confidence-building measures, and satellite pictures in August suggested workers were already dismantling an engine test stand at the facility. CSIS said activity is “evident” at the vertical engine test stand and the launch pad’s rail-mounted rocket transfer structure at the Sohae Satellite Launching Station – the facility from which Pyongyang launched satellites in 2012 and 2016. The CSIS analysis said the Sohae facility “has been used in the past for satellite launches,” which use “ICBM (intercontinental ballistic missile) technology banned under UN Security Council resolutions”. In a briefing to parliamentarians this week, Seoul’s spy agency said it had detected signs of work at the site. The director of the respected Washington-based 38 North project cautioned that the evidence was not necessarily “consistent with preparations for an ICBM test”. North Korea conducted its first successful nuclear test in 2006 followed by a string of increasingly successful ICBM launches. In 2017, it claimed it had become a nuclear state, capable of fitting a viable nuclear weapon on an ICBM that could reach as far as the United States’ eastern seaboard. In the same year, the UN Security Council banned the North’s main exports – coal and other mineral resources, fisheries and textile products — to cut off its access to hard currency in response to Pyongyang’s pursuit of nuclear arms and ballistic missiles. 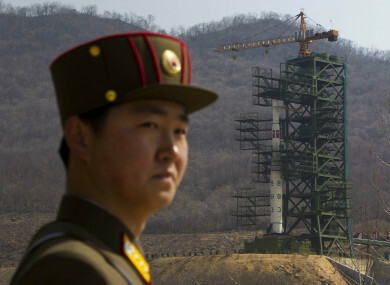 Email “North Korea 'rebuilding' main satellite launch site, satellite photos show”. Feedback on “North Korea 'rebuilding' main satellite launch site, satellite photos show”.